Here are my slides from last Sunday’s talk. Thanks everyone who asked questions and provided feedback! Most web sites are disposable – they are built once and not changed until they are replaced. But some sites and applications are made to last – to be updated frequently as part of doing work for a business, for years. 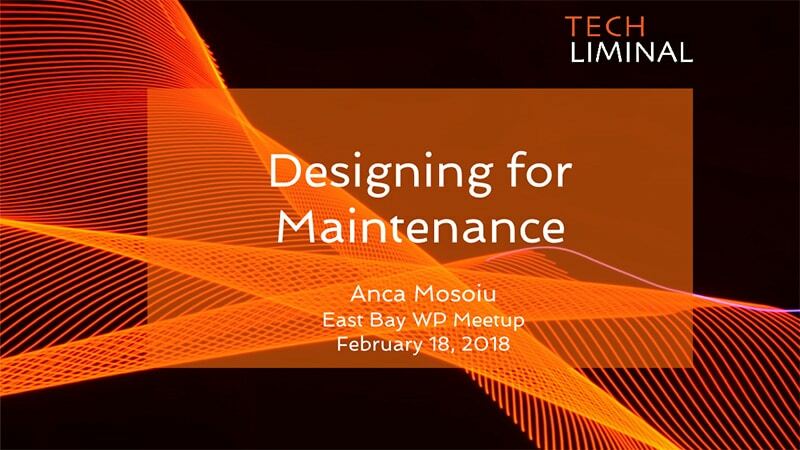 In this talk, Anca will present best practices that smart developers use when building things to last for years. The talk will cover aspects of design as well as development, and is suitable for site owners as well as developers. What does maintenance mean for these clients and sites? How do you teach your users? Adding functionality with plugins & custom code. Use a centralized management system like ManageWP or InfiniteWP if you are maintaining several client sites. Anca Mosoiu has been developing sites and applications with WordPress since 2006. She is a programmer with deep experience designing and developing content management systems for organizations large and small, and is a frequent speaker at WordPress meetups around the Bay Area.